Pictured at the launch of the Gain Greyhound Nutrition Select 525 Stakes at Kilcohan Park Greyhound Stadium were Willie Rigney, Gain Feeds Business Manager, Jimmy Maguire, Chairman, Kilcohan Park Greyhound Stadium, Kathleen Lennon, Racing Manager, KPGS, two time World U-23 rowing medalist, Andrew Goff and trainer, Fiona Goff. Photo: Noel Browne. 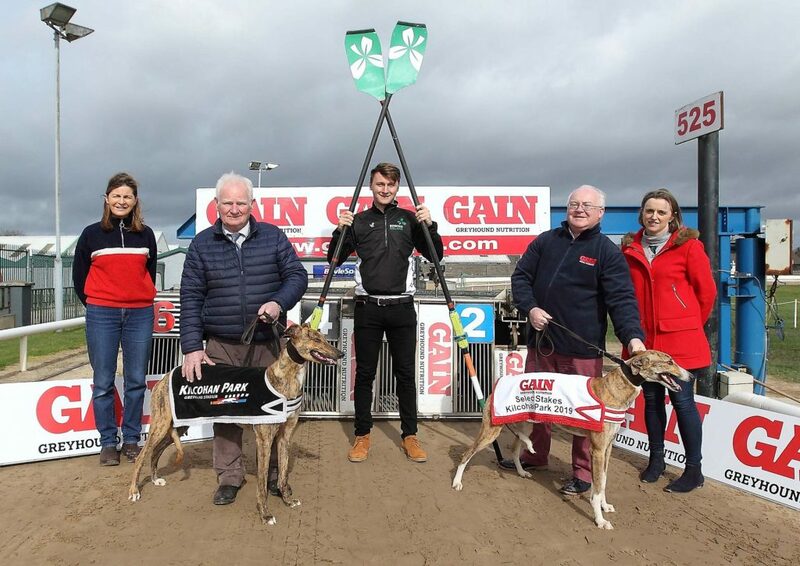 Two time World U-23 Rowing Championship medalist, Waterford’s Andrew Goff was on hand this week to officially launch the 2019 Gain Greyhound Nutrition Select 525 Stakes event which takes place at Kilcohan Park Greyhound Stadium (KPGS) in April. Gain Feeds, a leader in the greyhound feed industry is sponsoring an exciting programme of racing at KPGS which will see top greyhounds from across Ireland compete for a winners prize of €13,000. The Gain Greyhound Nutrition Select 525 Stake will commence on the 13th April 2019 with the final taking place on April 27th. The Select Stakes invites the highest winner from all other major races across the calendar year to compete. The entries close on Tuesday, April 9 at 12 noon. On the night of the final the ever popular annual small dog terrier race will also be taking place. The novelty race will take place over 50 metres. The winning terrier will win a €200 Gain Pet Food Voucher to be redeemed through any Gain Pet Food Stockist. The other contestants will win a bag of Gain Elite Pet Food for their participation in the race. Speaking at the launch of the stakes Carl Pallas Sales and Commercial Manager for KPGS said “It’s an honour to have the continued support of Gain Greyhound Nutrition for 2019. The Gain Greyhound Nutrition Select Stakes was first introduced to the racing calendar in 2012 and proved very popular. It is getting bigger every year. Gain also cater for all dog breeds which is why we have introduced the terrier race. It’s also great to get successful Waterford rower Andrew Goff involved this year”.